This stone weighs 137.02 carats and is one of the largest D-color Flawless diamonds in the world. In March 1978 the Premier Mine in South Africa, the mine that produced the 3106-carat Cullinan Diamond, yielded yet another remarkable diamond, a triangular-shaped cleavage of the finest color, weighing 353.9 carats. Like an earlier gem found at the Premier, the Niarchos, this one too travelled right through the various stages of mining recovery only to emerge at the final one, the grease table in the recovery plant. For reasons of security, the news of the finding of the diamond was not released for two months. After it had been disclosed, the press quickly began speculating about possible destinations for the eventual polished gem. Prince Rainier of Monaco was obliged to deny reports that he was planning to buy it as a wedding present for his daughter, Princess Caroline, who was getting married soon; another European royal family was rumored to be interested; Emperor Bokassa of the Central African Empire, who had already spent £20,000,000 on his coronation, was said to have made an offer. In the end the Johannesburg firm Mouw Diamond Cutting Works purchased it, naming it after Mrs. Rose Mouw. The Mouws then contacted their American partner, William Goldberg, who promptly purchased a share in the diamond. When he set eyes upon it, Mr. Goldberg exclaimed, "A lot of people are going to be interested -- this is an unusually exciting diamond." The cutting was carried out in South Africa and produced three gems which became known as members of the Premier Rose family. The largest, which has retained the name Premier Rose, is a pear shape weighing 137.02 carats, cut with 189 facets (most of which I believe are around the edge of the stone -- I think it is a standard pear shape with a faceted girdle) and measuring approximately 43.40 by 23.20 by 18.93 mm. It was submitted to the Gemological Institute of America for certification where it received a D-color and Flawless clarity grade. It took 385 hours to cut, which due to the size of the finished stone is fairly quick -- the time amounts to about 16 straight days. At the time it was then the largest stone of this caliber to have been certified by the GIA. 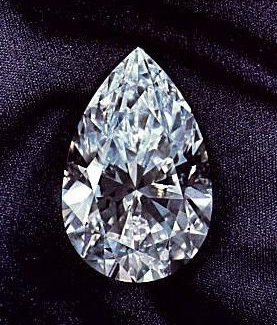 The weight of the Premier Rose makes it the fifth largest pear-shaped diamond in existence: the Star of Africa being the first at 530.20 carats, the Millennium Star being the second at 203.04 carats, William Goldberg's unnamed 200.87-carat golden yellow pear being third, and the brownish-yellow Star of Peace at 170.49 carats being the fourth. The William Goldberg Diamond Corporation of New York handled the sale of the gems. The Premier Rose was sold in 1979 to an anonymous buyer for about $10,000,000; the sale of the two smaller diamonds followed shortly after. Recently, Robert Mouawad has added the Premier Rose to his great collection of important diamonds. The stone is now valued at over $10,000,000.